Before a book goes on sale, publishers and authors must consider what will help that book break through the noise in the market. While there’s no easy answer for how to make a book stand out, there are strategic ways to help it along. Here are some of our best practices for thinking about building pre-publication discoverability and buzz. Metadata refers to all of the rich information about your book that helps readers discover it, including information like the title, author name, book description, ISBN number, category, and keywords, among other details. Metadata is extremely important, especially if you want your title to show up in recommendation algorithms on retail sites. In a digital marketplace, where readers aren’t looking at any physical objects, discoverability relies on these details. For instance, if you don’t have any categories in your metadata, the book will simply not show up in any category that readers may be browsing. It’s like putting your book in a bin full of other random books, instead of placing it carefully on a shelf among similar books for readers to find. 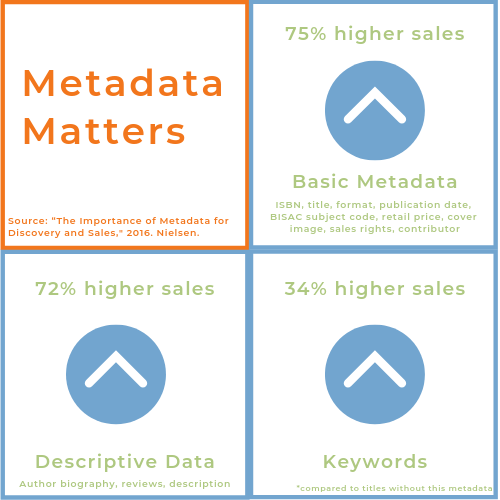 For more information on metadata, Publishing Perspectives has a nice overview of metadata from 2011 that is still relevant today. Nielsen recently published a paper on the relationship between metadata and sales. And if you’re really curious about metadata in today’s publishing landscape, BISG has plenty of resources. It’s important to set and monitor goals for your marketing and publicity efforts during the entire life of the title; from pre-publication to publication, and even through backlist, if appropriate. For all of these strategies, ask yourself: What am I trying to achieve with this promotion? What constitutes success? If the promotion is not achieving my goal, what will I try next? “Effective frequency” is the concept that consumers are more likely to complete a purchase after having seen the product a certain number of times. While there is no magic answer about what that number might be, we do know that visual and name recognition are crucial. The more your title, book cover, and author name are out in the world, the better. So how do you go about getting all those eyes on your book, especially before it’s on sale? You already know that galleys are a great way to start buzz about a new book. Whether you’re sending printed galleys, utilizing NetGalley to deliver secure digital galleys, or using BookishFirst to give readers a sneak peek at your book and a chance to win a galley in a raffle, you should think about whose eyes you want on that early content, and why. 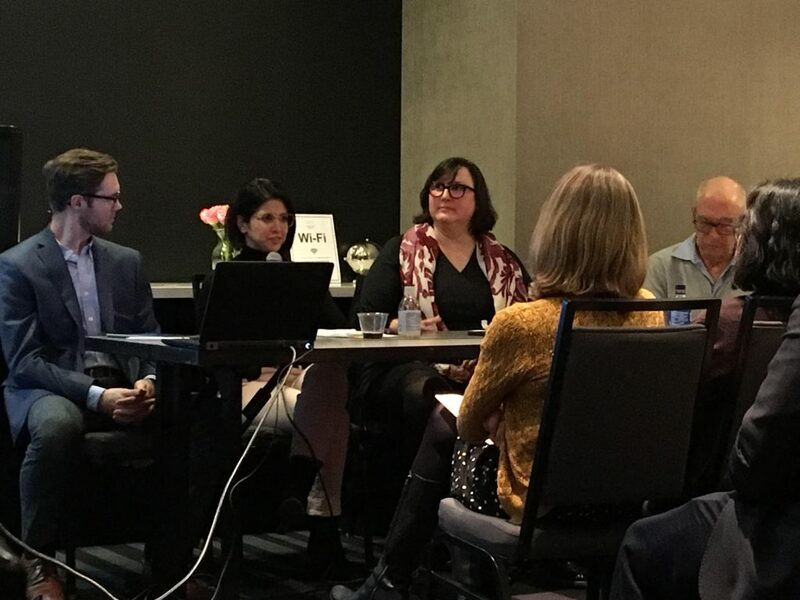 When you’re thinking about the right audience to create pre-publication buzz, make sure to consider influencers like librarians, booksellers, and educators. These are some of the most important voices for building word-of-mouth buzz about books, and are important advocates for books in their communities. Identify trade publications that these influencers are reading, like Library Journal and Booklist, and focus effort there. Pitch the title for review or use some of your budget to advertise in that space. Plus, be sure to leverage any reviews you receive by adding Advanced Praise blurbs to your metadata, share them on social media or in press releases. These are widely trusted and respected outlets, and their reviewers’ opinions are held in high regard. Don’t forget that many libraries and independent bookstores have blogs. Reach out to your local branch of the public library and talk to your neighborhood bookseller about reviewing your book, or nominating it for recognition on the Indie Next List, LibraryReads, or Loan Stars, all of which are monthly lists based on recommendation by those influencers. When you solicit reviews in a targeted way, it’s likely that you’ll see a greater return on the number of copies you’ve given out. Figuring out who the most likely reviewers are takes time, but it’s a worthwhile endeavor. Before you start, determine where you would like your book reviewed, and why. Where is your target audience going for book recommendations? A bevy of reviews in that space is a convincing argument to a reader that yours is a book being talked about, and that they should join that conversation.